Today [September 29, 2012] we had the chance to visit the Alexis Vive collective near Agua Salud, Caracas, and interview Ana Marin, militant of the the collective and key member of the El Panel 2021 comuna.The Alexis Vive collective is famous for its autonomy and independence, yet it is a crucial part of the Bolivarian process as a whole. We were given a first-hand account of the dialectical relationship between the development of popular power in these collectives, and the development of the Bolivarian Revolution nationally in the progression towards socialism. 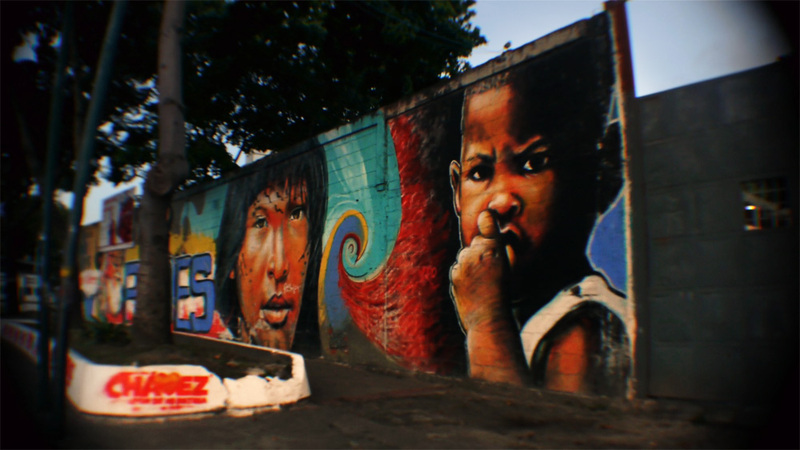 The Alexis Vive collective was formally created in 2004, but this was the realisation of community work that has been developed since 1993, following the response to the Caracazo in 1989 and the failed uprising that Hugo Chavez led in 1992. Based on political lessons they had drawn from studying the Paris Commune, the Zapatista movement in Mexico and the soviets of the Soviet Union, Ana explained that the aim was to "develop the maximum participation of the community in producing what is needed to live". Named after Alexis Gonzalez, an activist from the community who was killed on April 11, 2002, while defending the sovereignty of Venezuela against the coup d'etat, Ana explained that "Alexis lives in all of us, in the development and defence of our community spaces, our politics, our process, our practice, the creation of our comuna." Ana walks us round the local area. She explained that the collective currently organises around four pillars: social production, defence, the development of the comuna and REDES*, a political party that has been created nationally to mobilise for the presidential elections. 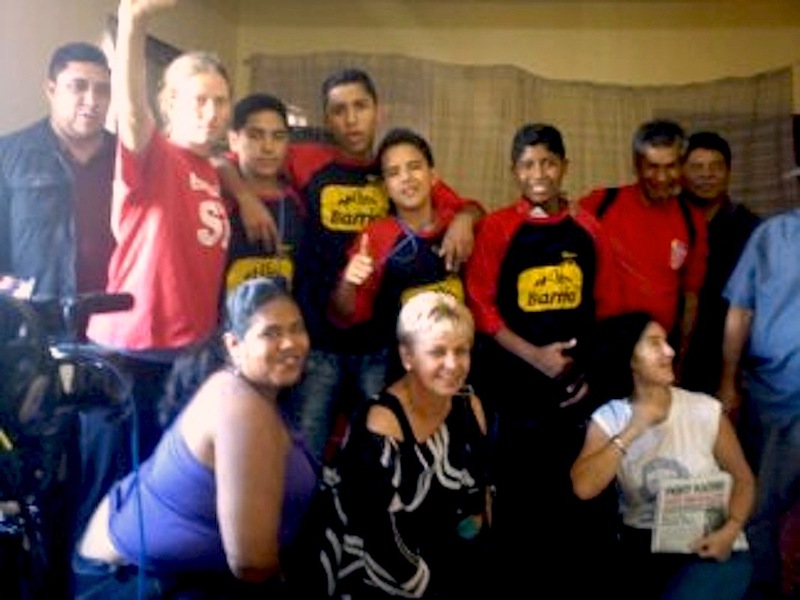 The collective seeks to involve everyone in their community, regardless of whether they identify themselves as Chavistas or not, through participation in developing the comunas, developing proposals and representing these in the National Assembly, producing goods to sustain the community or through the councils that are developing community education, sport, culture and social media among other sectors. Ana emphasised "we aim to involve everyone in something, respecting political and cultural diversity. This is because the revolution is a way, a mode of life, its not just about wearing a T-shirt or a jacket from a political party, not everyone fits in the same mould, there are various moulds." Underpinning each of the four pillars is the development of popular power and political consciousness. The comuna has its own sugar-packing factory, textiles workshop, alternative radio and TV station, bakery, urban farm and a brick factory for producing the materials necessary for constructing houses. Ana explained the process of empowerment inherent in this social production: "We receive financial support from the government but we work to develop our independence from the state, the government gave us funding to buy tools, for example in the bakery, but on the basis that we use these tools to produce. We're not just parasites taking from the government, we don't just ask the state to give, give, give, we need to diversify the economy and produce the basic necessities to survive. With this development of popular power, we seek to redistribute the riches of the country. We don't depend on the mayors, the governors, the people can solve their own problems given the means, this strategy is what we are fighting for ... It is our role to develop the political will, to be motors that drive forward the process of empowering the people." The theme of defence is crucial, the collective polices itself and is an organised, armed community, a practice which is firmly located in political theory and understanding. Comparing the difference between a paid soldier under capitalism, and the political approach of the Alexis Vive collective, Ana pointed out: "In the constitution we are charged with the responsibility of defending the country. Take the example of the paid soldier, they receive money from the state, and under capitalism, if they don't get paid, they are not going to defend their country, they are only paid to defend the capitalist state, they act as mercenaries. Our method of defence differs from this, in our community we don't believe in remuneration for the defence of our sovereignty, we believe in defending the revolution through political consciousness, where the people are organised and armed for the love of their community and country. Defending our way of life." 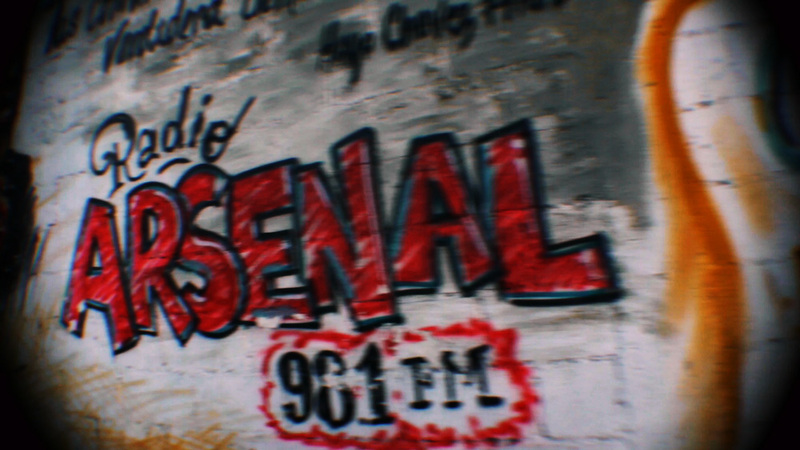 "Our role is to raise consciousness, to be protagonists, exercise our power, for this we produce our community newspaper and radio, which is called Arsenal." Ana also spoke of the importance of alternative media as a method of defending the gains of the revolution, and specifically their community. "Our role is to raise consciousness, to be protagonists, exercise our power, for this we produce our community newspaper and radio, which is called Arsenal. This is to disseminate the ideas and vision of the the Alexis Vive collective, to explain our successes and achievements. Since the last century when TVs became the norm in most peoples homes, this has created public opinion, dominated by capitalist consciousness. We have to break the modes of capitalist media, to provide an alternative." The development of popular power, through the comunas and the communal councils is a key process in the destruction of the old bourgeois state. The ruling class continues to wield a significant amount of power in Venezuela and there exists a state of dual power, where the comunas and social missions continue to grow and strengthen but the old structures of mayors, governors and private services are still maintained. In discussing the necessity of destroying the bourgeois state, replacing it with a socialist state, Ana argued that "we have to remember that following the Caracazo in 1989 and the failed 1992 uprising, the Bolivarian revolution has assumed a democratic path through elections, beginning with the election of Chavez in 1998. We've not seen a revolutionary war like in the Cuban or Russian revolutions. Of course we study the teachings of Mao and Lenin in the necessity of insurrection and the destruction of the capitalist state. However, at this point, in order to destroy capitalism we have to compare the approaches, capitalism produces death, we produce life, in a capitalist bakery, they produce exploitation, we have a bakery where we develop consciousness, where we work as a collective, this is our insurrection, to show that there is another way of life, another system. Currently our form of insurrection depends on developing the consciousness of the Venezuelan people, creating popular power. If you ask me, how do we overthrow the old state? My answer is through the comunas." 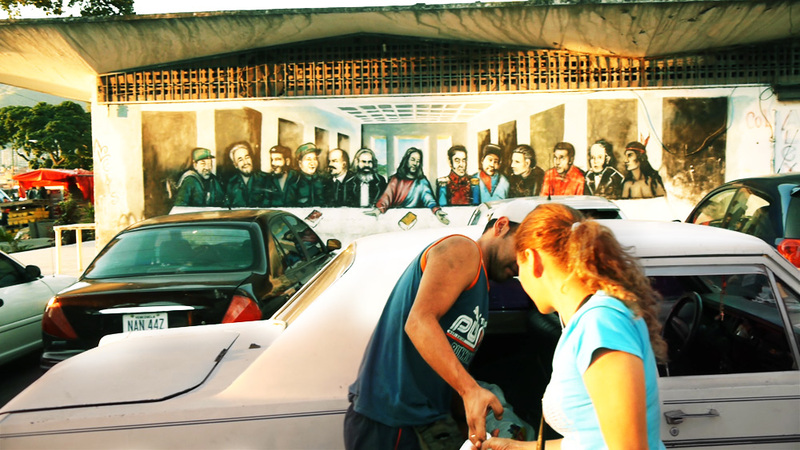 Local mural depicts the revolutionary figures that inspire the movement in different ways, including Fidel Castro, Mao, Lenin, Marx, Jesus Christ and Simon Bolivar. While mobilising for the presidential elections is certainly a necessity at this moment in time, Ana was completely clear that in order to advance the socialist process, they have to look beyond the elections. "While we are participating in REDES and mobilising for the election, our politics and aim is to develop the comunas." This is not solely an organisational question, but is based in Marxist politics. "while it's true that these ideas didn't originate from our continent, you must remember that colonialism brought capitalism to Latin America, the merchants developed capital and capitalism, from this developed trans- and multinational companies that robbed our continent. We have experienced the globalisation of exploitation, the globalisation of hunger, of death, so now we believe in the globalisation of ideas. Marxism isn't a dogma, a doctrine, it's not copy and paste, it's a knowledge that allows you to interpret the world and to change it, transform it, it's a science. Marx analysed the reality of capitalism, exploitation, and its contradictions, this is why these ideas remain so important to us today." The process of communal power in Venezuela demonstrates the dialectical relationship between theory and practice, it is not possible to develop the politics of the Bolivarian Revolution without community organisation. Neither is it possible to achieve the aims of the collective by organising autonomously outside the struggle for socialism. 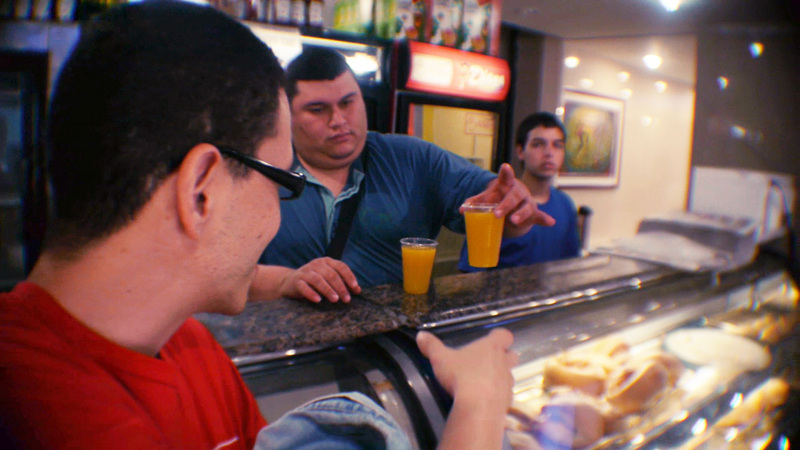 The discussion continues inside the comuna bakery. While Ana was showing us around the comuna bakery, it struck me how the experience of Alexis Vive contained vital lessons for the Bolivarian process as a whole, simultaneously developing popular power, the forces of production and raising socialist consciousness. Calling for the development of 3000 comunas, that will represent 68% of the population, Chavez clearly recognises the value of the comunas in building the Bolivarian revolution, as a tool in dismantling the old bourgeois state. Revolutionary artwork surrounds the area. Meeting with the PDVSA at the plant to discuss politics and processes. October 11, 2012 -- After speaking to political economist Pablo Giminez about the importance of developing Venezuela's industrial production, we had the chance to visit a gas cylinder factory and see these politics in process. The PDVSA Gas Communal "Ambrosio Plaza" plant in Las Guarenas, Miranda state, produces over 1000 gas cylinders each day, contributing to guaranteeing the supply of subsidised gas for domestic use to the Venezuelan population. Ninety per cent of families use this gas for cooking and for their household needs. The state-owned company is a product of the expropriation of two private gas companies that participated in the oil lockouts of 2003 and 2004. 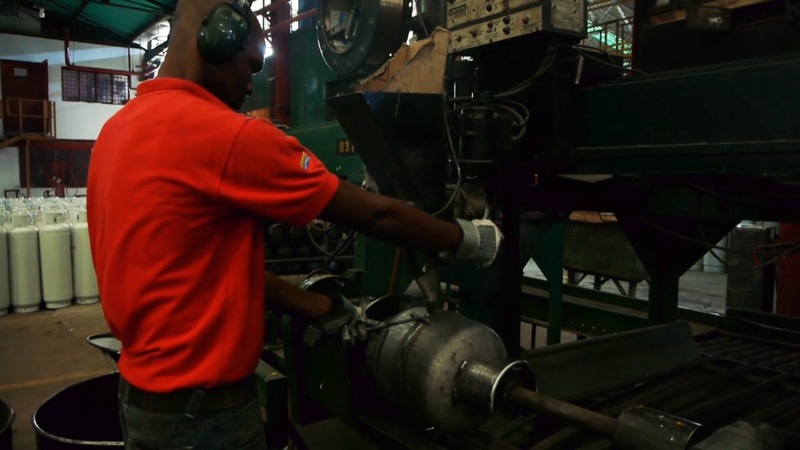 Vengas and Tropigas were expropriated in 2006 and now the state-owned company makes up around 50% of the total gas market with 58 generator plants and 10 manufacturing plants. All the raw materials for the plant come from Venezuelan companies, fostering the kind of manufacturing links required for national productive development. As Royer Gonzalez, one of the managers of the plant, explained, "we are working to change the consciousness of the workers, we were a private company that was expropriated but now we're working for the state in order to develop socialism. The old way of organising, through traditional trade unions struggling against private bosses to improve our living conditions no longer fits our model. Of course, we participate in the direction of the plant and to ensure our standard of living, but now our boss is Chavez, the state, the whole of our society, we are now working within the process of socialism." Royer explained that through the workers' councils, PDVSA gas communal had participated in discussing and making proposals to the New Labour Law (LOTT), which was finally ratified in the National Assembly on May 1, 2012. The law has reduced the working week from 44 hours to 40 hours, in addition to developing workers' rights in relation to paternity and maternity leave, pensions and sick leave. Royer pointed out that "the debate over the new labour law was facilitated in many different forms, through Twitter, Facebook, workers' council meetings. It is the most revolutionary labour law that we have ever had, now this law defends the working class. Previously it was a law that defended the ruling class, the bosses." Making gas containers at the plant. We visited the plant to see the process of production of gas cylinders and huge gas tanks. Tania Uribe, a female plant manager, informed us that these big gas tanks were destined for the apartment blocks that have been built through the Great Housing Mission, which has already constructed over 244,000 homes. Maria Gabriela Irazabal, a young manager at the plant, emphasised the importance of the involvement of women in the plant, particularly now that the plant pays for child care and the workers receive a subsidised lunch through the "mission of knowledge and work". Alongside child care, the government has also developed a "vacation plan" to look after and provide opportunities for children outside school terms. 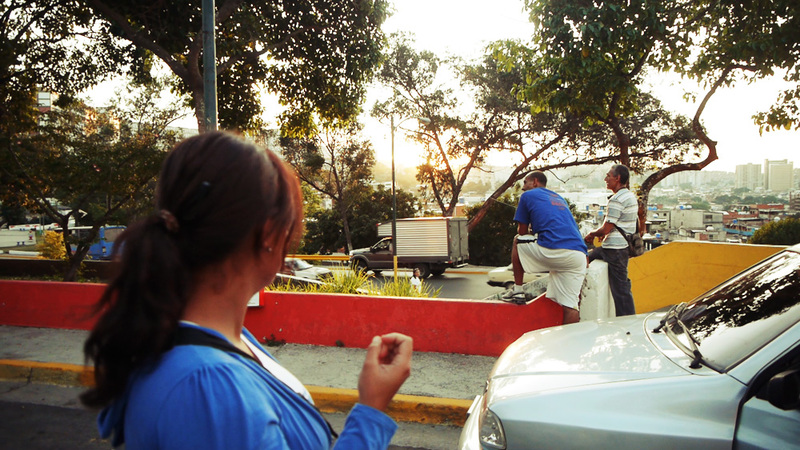 This kind of collectivised provision has allowed women to play more of a role in the overall work of PDVSA gas comunal. Freddy Trujillo, a 22-year-old worker at the plant, explained the importance of developing political consciousness. Through their work "now we are working alongside Chavez, working to construct the gran patria (great homeland), not just for ourselves, for our own standard of living, but for all the Venezuelan population, ensuring they receive the gas they need to meet their domestic requirements'"
Freddy explained that the plant does not just produce gas cylinders, but provides educational and cultural opportunities for its workers. "From 2 pm to 4 pm everyday we can attend classes of Mision Ribas, an educational program where adults who haven’t completed their secondary school education can gain qualifications that allow them to attend university. We also hold regular cultural activities, organise campaigns in support of the revolution, particularly over the elections, and hold regular MERCAL subsidised food markets for the employees." As Maria Gabriela pointed out, "We are not only producing goods here, but we are transforming consciousness and organising politically. We hold forums, film showings, organise study brigades to Cuba. As Che spoke of, we are developing the new man and the new woman." Meeting at the center Antímano. October 11, 2012 -- Today we had the privilege of visiting community organisers in Antímano, a paroquia of Caracas known for its organisation and resistance. Antímano is one of the most deprived areas of the city, where many migrants from the countryside came to settle with the discovery of oil and development in Venezuela. As a result the barrio stretches high up into the hills and is bursting with self constructed houses, built with little planning. We met with PSUV activist Jimmy Gudimo who has over 20 years experience of community struggle, Gabriel Rivas, a land committee and communal council organiser involved in developing 800 new houses with the Great Housing Mission in Antímano, and popular educators from the ideological cadre school of Francisco Miranda who have been working hard to transform social consciousness in their community, developing popular participation in the resolution of meeting the communities' basic needs, particularly in guaranteeing water and gas supplies. The areas contains more than 150 communal councils organised into 10 comunas built around the backbone of social organisations such as Barrio Adentro health-care and the education missions of Ribas, Robinson and Sucre. At the heart of the community, high up in the hills, we were invited to participate in a live TV and radio broadcast from Barrio TV and Toromaima Rebelde. Aired on channel 27, The Barrio TV channel has now been up and running for just over a month and a half and seeks to discuss and spread news of the popular struggles in the community and beyond. To our surprise, the interview was filmed by Federico, a 15-year-old community media activist, and three of his friends, who were playing an active part in the development of popular power, recovering the airwaves from the clutches of the private media. Leidy Rosendo, the presenter, spoke of the need to develop the communal councils, communas and social organisations in order find collective solutions to community problems, quoting Che Guevara in his proclamation that "only the people can save the people", only the community can solve its own problems if given the power and control over its resources. When asked to give a message to the listeners of the radio station we declared: "For us, anti-imperialist, communist activists in Britain, the process towards socialism and the achievements of the Bolivarian Revolution in Venezuela inspire us to keep fighting. The impact of the process, not only for the the Venezuelan people nor for the whole of the continent, but across the world, cannot be underestimated. The Bolivarian Alliance for the Latin Americas (ALBA) with Venezuela and socialist Cuba at its heart, demonstrate that a better world is not only possible, but is being built here in Latin America today. Our role is now to learn from the struggle for socialism in Venezuela and take its example into our own communities, in order to fight against capitalism from inside the belly of the beast."